Originally, I didn’t know how I will feel about watching a movie where Will Smith and his son are in the same movie. It sort of felt like self-promoting on Will Smith’s part to try and get his family name out there. After watching it, It wasn’t that bad I suppose. It had some decent cg but some of the green screening looked weird. Example- When Will Smith was saluting the guy in the floating wheelchair. The background looked really fake. Besides the visuals, the movie was mostly about Jaden. Will Smith didn’t play a major role. The ending wasn’t climatic as I thought it would be. 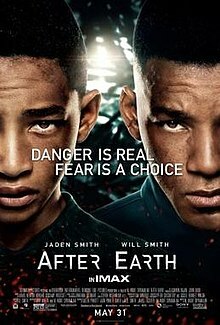 Besides that it was a solid movie with decent acting by Jaden but I would wait for this movie to come out on bluray/dvd. It’s a good movie if you have a family but nothing you would want to watch alone. Me personally, I can’t watch movies with child actors and take it serious. This entry was posted in Movie Reviews and tagged After Earth, Film, Jaden Smith, M. Night, Will Smith. Bookmark the permalink. Great review. I know I’m alone on this boat, but I actually didn’t mind this flick as much. Sure, it wasn’t perfect, but at least it was better than what I expected coming from M. Night. Whatever happened to M.Night. I wish he would go back to making movies like unbreakable/sixth sense.